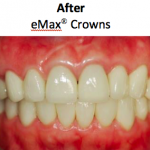 All ceramic crowns are a very effective way of creating a “new look”. However, they should not be used in all situations. Each patient needs to be carefully evaluated to assess how much tooth structure is available for seating the crowns for a long-lasting, more durable restoration, and whether there are too many missing or loose teeth for all ceramic crowns to be used. This patient was seeking a significant cosmetic improvement. Over the years her teeth had become darker and darker, and, given her wide smile line, she was not happy with the “look” when she did smile. She was very self-conscious about how she presented to those around her. 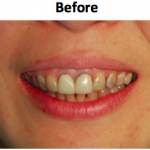 The two crowns directly in the front of her smile line, on her maxillary central incisors, did not look right when she smiled because they were too “dead white”. They, simply, were not “natural”. This problem was magnified by her very high (gummy) smile line. 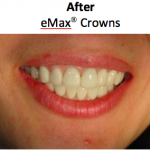 eMax® crowns were used to cover over her dark colored abutments with natural colored, more translucent crowns to make it less obvious when she smiled. There are two different ways that all ceramic crowns are fabricated: 1) milling the complete anatomic form by a milling machine and 2) milling the base with then creating a custom crown by creatively applying porcelain with the right “look”. We use the latter procedure with our in-house technician creating the custom color and translucency for each tooth. 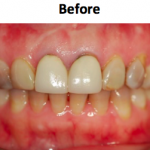 While this is a more intense, time consuming procedure, it provides a much better appearance. In this case, the tooth colored copings were first custom fabricated by our technician who “pressed” the porcelain to the tooth replicas (dies) for a tight, long lasting fit. This provides a more exact fit than ceramic zirconia crowns that are only machined (milled). 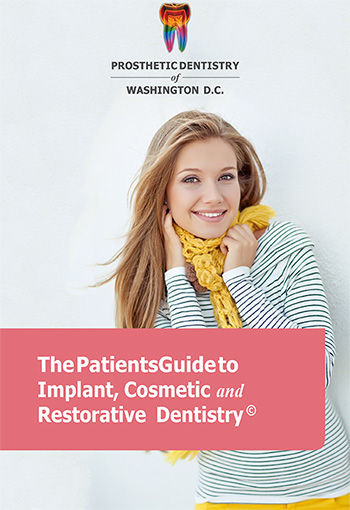 Our technician then customized the esthetics of her crowns, by creating those base crowns or copings and then custom applying the porcelain according to the patient’s personal esthetic requirements. She ended up with very natural looking crowns with no one focusing on her teeth when she smiled. Needless to say, she is very happy, and is no longer self-conscious when she smiles.